I want to quickly share my Tuesday nail polish and then let’s talk Target. Today, the third installment of my Nail Polish-A-Day Challenge and I chose my favorite reliable OPI Red: Color So Hot It Berns. 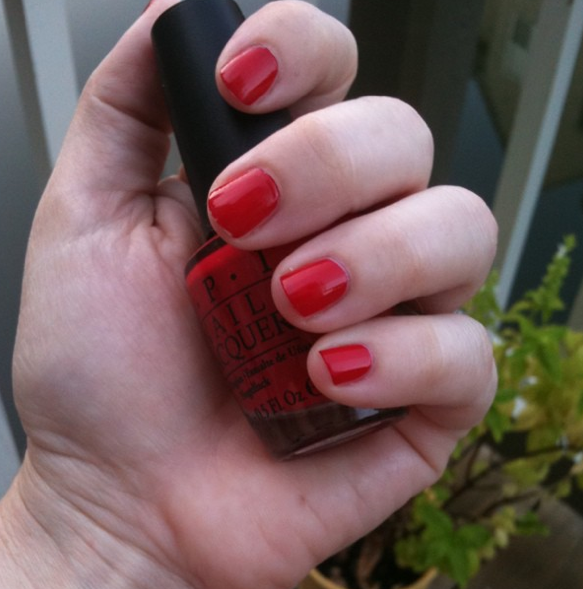 Red nails are classic and this perfect red was part of last Fall’s Swiss collection. I should probably go buy more of it. I did not go to the gym this morning as promised but plan to go this evening when I get home from work. However, I did learn that I can in fact get up early in the morning when it’s dark out if there is good enough reason to. And today, there was: Target for Missoni! The Caroline Street store in Atlanta was my goal. I thought about going on my lunch break, but last night realized that I probably needed to get in when they opened at 8am. I set some ground rules for myself: No more than two items or budget of $100, don’t buy it if you don’t love it. I’m fairly new to shopping events so I wasn’t quite sure what to expect. I woke up at 630am, showered, ate breakfast with my cat Figaro and bolted out the door at 730. I arrived at Target at 8:04. A few cars but nothing drastic. I’m never at Target anywhere that early so it didn’t seem unexpected. Inside was a different story! First of all, the employees still had everything in boxes. I worked in the Virgin Megastore, French Quarter for almost 5 years and if we were expecting a huge release, we cleared shelves for it around 11pm on a Monday night! Crowds of women were pulling stuff out of boxes. It’s like they didn’t even care about the sizes. They just wanted it. I was embarrassed for women today! It felt a little ugly. All the accessories were snatched up and one woman’s child was buried beneath the Missoni signature fabrics! I thought it was a cart full of return items until I heard it speak!! All I wanted was the velour hoodie from Look 5 and something else. I started to feel concerned that I may not get what I wanted so I started to grab whatever was available in my size. I pulled two dresses and a green sweater, when finally I saw the velour hoodie, in my size, one! sitting on a rack and no one near it. I grabbed it and ran off to the dressing room. I tried it on as well as the sleeveless sweater dress (the one cute little Elizabeth Olsen was seen wearing on the red carpet) and fell in love! By 8:36 I had paid $102!!!! and was on my way to work. Nightmarish I tell you, but what a rush! 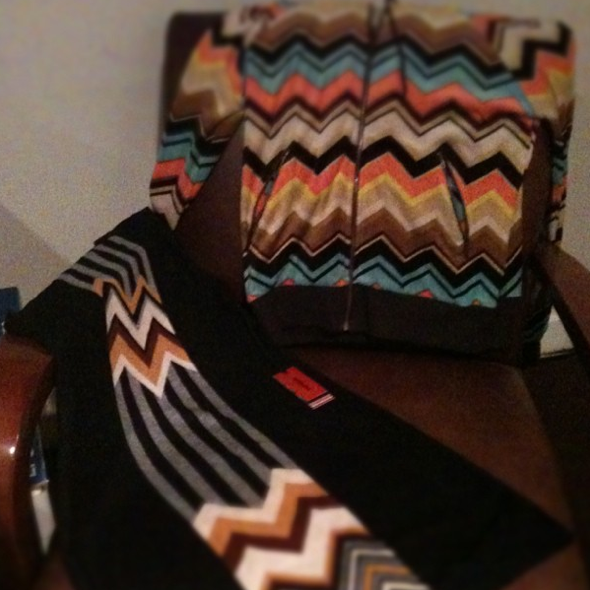 And now, I own two pieces of the Fall 2011 Missoni collection for Target.